Martial Way’s Martial Arts Camps for children (ages 5 through 13) provide fun days of engaging physical activity. Children respond to the action and excitement of the martial arts, while parents appreciate the discipline, focus, and important life skills it teaches. Camp is a great way for newcomers to get an introduction to the martial arts, and for current students to practice and learn new martial arts moves. Many come away with great friends and an exciting week full of activity! Many options for dates and location, full and half days, and partial weeks are available. 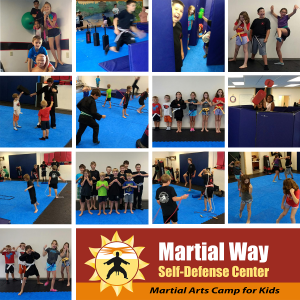 Camps are held at Martial Way Self-Defense Center in Colchester (73 Prim Road). Please see below for more details about Martial Way’s summer camps. Sensei Quinlan and Martial Way’s Camp Staff hope to see you at the dojo! June 24th – June 28th • 8:30am to 3:30pm • Colchester • Register HERE for this session. Save $25 and sign up by May 24th. August 5th – August 9th • 8:30am to 3:30pm • Colchester • Register HERE for this session. Save $25and sign up by July 5th. August 19th – August 23rd • 8:30am to 12:30pm • Colchester • Register HERE for this session. Save $25 and sign up by July 19th. Martial Way’s 3-day weekend martial arts camp for our adult students offers a chance for total immersion in Kempo-Jujitsu, Brazilian Jiu-Jitsu, or some of both–as well as the opportunity to participate in a variety martial arts seminars. Past seminars have included hand-gun disarm training, baton training, functional conditioning for the combat athlete, and Arnis. In addition to this intensive martial arts training, Martial Way’s adult Kempo-Jujitsu brown and black belt tests run concurrently and add to the overall celebration of the martial arts. 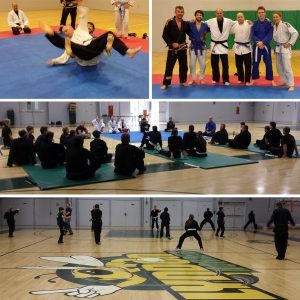 Registration is now OPEN for Martial Way’s adult Kempo and BJJ students. Camp is held at Northern Vermont University in Lyndon, Vermont, beginning Friday afternoon through Sunday afternoon, August 2, 3 and 4, 2019. Registration fee includes lodging, meals, training and a camp t-shirt. Please see the information below, email info@MartialWayVT.com with questions or talk to your instructor to learn more about this training opportunity. We hope to see you in Lyndon! Register online or at Martial Way in Colchester or Milton. Save $40 and sign-up NOW!